Any space has two main entities, inside and out side. Both entities are very important to experience the space. One of the most important element between these two entities, is a window, or a “hole in the wall”. It is the “connection” between inside and out side. Also, a window has a special interaction with the observer, one who looks through or experiences through the window. I am inspired by different meaning that people attach with windows, different behaviours and relationships that people have with window, different ways of using window to communicate and observe. I am interested in exploring what a window has to offer and how it can do much more beyond expected. I am inspired by people’s “curiosity” and obsession with act of “looking”. Every one is constantly observing people, objects, environment, activities around them, and they react to them. I am interested in using the act of “looking” as a main interaction between spaces and people, between inside and outside. One specific act of “looking” that I would like to explore, may be, is “peeping”. People are always more curious to find out what is behind something when there is something “unexpected” or “unknown” behind, a “surprise”. 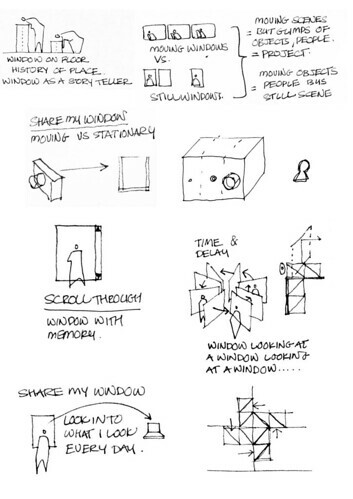 I started with simply thinking about many different contexts around window, hope people use the window, what kind of relationships, behaviours and interactions people have with windows, and with the act of looking. Initially I started looking at physical relationships between people, window and a space. What are the implications of different scales and positions of the window determines people’s “reactions” and “expectations” to and from the window. Also I was trying to find out different ways of communication through the window and how people personalize their own window. 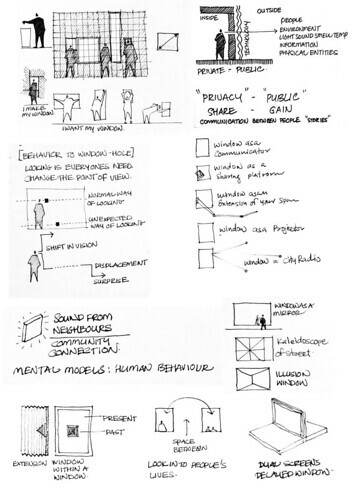 Having these initial ideas about the window and people’s act of looking through window, I started, mainly desk research, looking at various possibilities, technologies, methods, artworks, interactive projects and installations. For inspiration, I also looked for various photos and videos related to window and people around it. During all the desk research many small and big ideas kept coming. I always made small sketches and researched more for understanding implications of those. Some of them did not make sense after few days, and some of them were too superficial and complicated. During this long brain storming, desk research and discussions with other people, I realized that I am more interested in exploring people’s act of “looking” and behaviours, rather then physical window it self. Later, I started listing what are the interesting behaviours associated with the simple act of “looking”, and I found that “peeping” was one of the most interesting gesture or behaviour. Simply because every one is “eager” to look, find out, discover or just to get surprised. With this new idea or behaviour in mind, I started doing sketching new ideas and desk research. Many new ideas came along as I went deep in finding out how people “look in to” things. One of the inspiring object that I found during research was “periscope”, an object that allows you to “see beyond” or from a different “point of view” then one normally would see. It was interesting because periscope has two different ends and at both ends changing point of view phenomena happens. Another interesting example is “kaleidoscope”, in which visuals are reflected and mirrored in a dramatic way to create beautiful effects. Some of my research lead me into investigating more in to optics and illusions, different techniques and methods. This was very interesting area to explore because I could still connect this to window, act of looking, curiosity, peeping, eagerness and look in to aspects. Further more, my future exploration will be short listing some of the ideas that I could carry forward, and making experience prototypes just to check reactions of people. I have no idea where I would go with them, but it would help me just to strike a new idea. I never had any particular user group in mind, there for there was no scope for any initial user research. Rather talking to many people about the initial concept, triggered many interesting discussions, which were equally inspiring. There has been no linear process during this investigation, it was rather a self generated non linear research on personal interests. How can we use people’s curiosity and natural eagerness of “looking” through “something” or a window, to enhance and connect experiences between inside and outside, as well as between people? How can technology be part of spaces, where experience is driven by people’s behaviour rather then technology? Why do people want to observe and look ?? what triggers their “curiosity”? 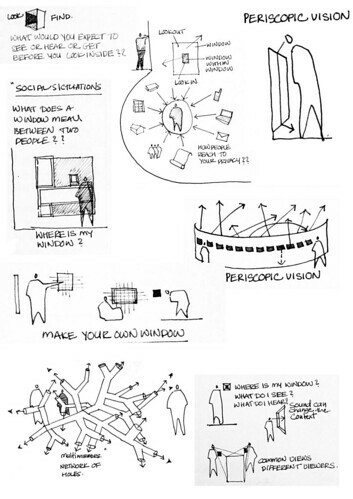 what are the behaviours they have around the window, or rather how can we use these behaviours to enhance experience of looking? How can we improve function of a window beyond its traditional meanings? How can we improve engagement of people to window and to other people? How can we use “peeping” as a behaviour for better experience between people? How can we extend what a window has to offer, to make better communication with outside and with others?